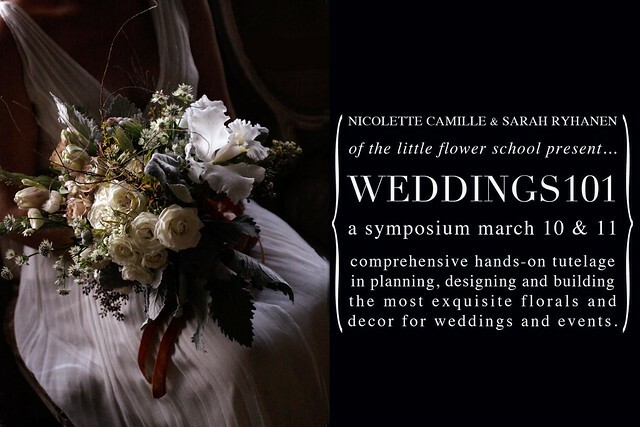 This is an intensive weekend-long symposium for those interested in learning the advanced art of wedding floral production. Nicolette and Sarah will share their expertise and experiences in the wedding industry through a series of discussions and hands-on lessons. Our goal is to share with pupils the lessons we’ve gleaned from the hundreds of weddings and events our studios have produced. We’ll share case studies of events and review our practices on flower budgeting and ordering. In addition, we’ll discuss in depth the advantages of working seasonally, share tips on flower conditioning, ideas for sourcing containers, and how to deal with props and rentals. A large portion of the weekend will be devoted to hands-on floral lessons. Our wedding designs are known for their loose, romantic and somewhat unstructured approach. Special emphasis will be placed on the nuances of layering color and texture. The weekend’s work will finish Sunday afternoon with a photo session aimed at capturing student’s hard work for their portfolios. And probably a cocktail. This class is intended for those with some floral knowledge who are looking to expand further into the wedding market and fine-tune their technical skills. Saturday we will meet at the Saipua studio; 147 Van Dyke Street in Red Hook, Brooklyn. Sunday we will meet at the Nicolette Camille studio; 50-52 Dobbin Street in Greenpoint, Brooklyn. How much floral knowledge is necessary? I would say that students should have basic handling knowledge of flowers. Wowza! That was so fast! Any chance of adding another? We'll definitely offer another Weddings 101 class in the future.